Offering you a complete choice of products which include personalized photo heart handle mug (red), metallic golden ceramic sublimation mug, size: dye sublimation, sublimation printing plain white ceramic coffee mugs with handle, color changing personalized photo magic mug, black ,yellow patch photo mug and matte fluorescent ceramic sublimation coffee mug. This item is a ceramic mug. The ceramic mug is available in red heart handle color. special are a great way to express your love and feelings to your dear ones.it has a red heart handle background and a capacity of 300 ml.such exotic mug which captures your best moments with loved ones for eternity is perfect to make them feel special. 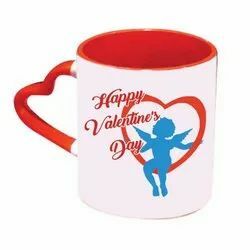 You can give it on special occasions like valentine day,birthday,anniversary, mother's day, father's day,raakhi and all festival, heart handle mug 300 ml. Metallic golden Sublimation Mugs - Blanks is a royal collection that is presented by our organisation to our clients. 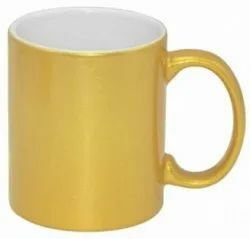 This golden mug is used for varied promotional events and offers ample area of branding. This Sublimation Mug Is Very Beautiful. Coffee Mug Let your mug speak for you. A beautiful coffee mug.Great excuse for sipping coffee and mingling around with friends in the office. White Ceramic,handled mug. 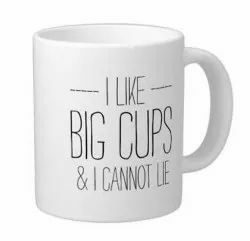 Can be used as a coffee mug or a mug for any of your favorite beverages (Hot / Cold). Ideal Gift. Comes in protective packing for safety of this fragile item. Add to cart, Buy now! Perfect for gifts. Make your loved ones feel special. It's Just A Black Mug Until Any Hot Liquid Like Tea Or Coffee Is Poured In - That's When It Shows Off Your Favorite Photos! Surprise Your Friends And Family! . · Black Patch 11 Oz. sublimation ceramic photo mug is an ideal gift for all occassions. Customization is possible. · Print your own " Black,Yellow Patch Photo Mug"
· You can customize the mug with printing your photographs on it. 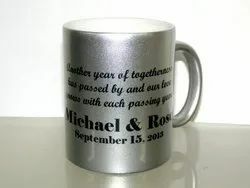 Metallic Silver Sublimation Mugs - Blanks is a royal collection that is presented by our organisation to our clients. This silver mug is used for varied promotional events and offers ample area of branding. Available in bulk, these silver ceramic mugs can be personalized with your business logo or any graphic of your choice. They even make great customer gifts! No matter the graphic, the print will shine with a powerful intensity.